Is it jazz? Is it contemporary easy listening music? What I can say is, it's not elevator music! 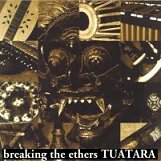 Tuatara is a group that started out with four players, who put together some pretty amazing music back in April of 1997 with a release entitled "Breaking The Ethers". I first heard this band on Monkeywrench Radio on January 31, 1998. Featured with many other artists that night, on commercial-free pirate airwaves, in the wee hours of the morning; Tuatara played a live set that never left my head. The first thought or feeling that popped into my head when I heard them was, Free. Their sound resembled nature, but not in a literal sense. They played music that made me feel like I was out in the open, without any barriers. That was a first for me, and that's why I dug a little deeper. I'm always on a quest for new or original music. I taped their set that night and was able to listen to the live performance till I was able to get my hands on "Breaking The Ethers". This CD fed my curiosity about the band and confirmed my suspicion about their talent. This release is filled with a nice selection of music ranging from jazz to something I can't quite describe in a "classification". The something is "alive", it's "elusive", and it's very illusionary. That may sound like a contradiction, but the evasive nature of the classification makes the rhythm very picturesque. My experience with jazz music has been with Miles Davis and Spyro Gyra. Tuatara is different. 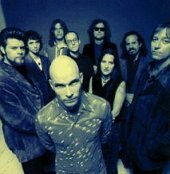 This unique music comes from the corners of the known and unexpected (to my surprise): Barrett Martin, drummer for the Screaming Trees; Justin Harwood, bassist for Luna; guitarist Peter Buck of R.E.M. ; and (the understandable jazz connection) saxophonist Skerik, co-founder of Critters Buggin. "Breaking The Ethers" is a delightful sound experience. With smoothing peaceful tracks such as "Dark State of Mind" and "Burning the Keys"; broad bluesy tracks such as "Saturday Night Church" and "The Getaway"; and deep (almost tribal type) tracks such as "Breaking The Ethers/Serengeti", "Dreamscape", "The Dessert Sky", "Goodnight La Habana", "Smoke Rings", "Eastern Star" and "Land of Apples" - this compilation is out there all on it's own like a twinkling star that just came to be. In the time it took me to find out about this band, I learned that they were working on a new release. "Trading with the Enemy", which was released in June of this year, is another mind-expanding mantra. In addition to mind expansion, we have some band expansion also with this set of 12 songs. Joining the band on this effort are: Scott McCaughey of Young Fresh Fellows, Minus 5; Steve Berlin of Los Lobos; percussionist Elizabeth Pupo-Walker; horn men Christopher Littlefield and Craig Flory; and multi-instrumentalist Mike Stone. Steve Berlin and Scott McCaughey also contributed to the first release, along with Mike McCready of Pearl Jam and Elliot Haas. The songs on this new release have been described as unfolding like a soundtrack to an unmade movie. This is very true. Slightly reminiscent of Spyro Gyra's recent release entitled "Road Scholars", Tuatara's new music paints pictures in your mind. I want to say it like meditation music, but it's prettier than that. But a deep concentration and a relaxing peacefulness can definitely be attained through these songs. It's like bliss without the long tired road to get there. But "Trading With The Enemy" isn't as laid back as "Breaking The Ethers". It starts out soft and gentle, with songs like "The Streets Of New Delhi", "Night In The Emerald City" and "Negotiation". Then it start to waken you and prepare you for more tempo, slowly, with songs like "Fela The Conqueror" and "Wormwood". However, the eighth song, "Koto Song" is so delicate that you'll forget you were on an upswing. That's not a bad thing, because this song takes you by the hand and wraps around you like a star-lit sky. "L'Espionnage Pomme De Terre", if I remember correctly, was played on Monkeywrench '98. Their live set sounded identical to the studio cut. I find that to be impressive with any band. This song is a chart topper! The mixture of horns and percussion is exciting and fun to listen to. The rest of the record just climbs to the end with a very sassy "P.H.C" and a energetic and funky "Afterburner". Both "Breaking the Ethers" and "Trading With The Enemy" are fine efforts filled with extraordinary talent. The music has variety. It's interesting, moodful, colorful, and most of all, very easy to listen to. There's not a boring note in either recording. I give both these releases an A, and I recommend you go out and add them to your music collection. For jazz connoisseurs, these two are must haves.